Journalism is thirsty for the concrete and the detailed, the here and now, and it is dependent on local news sources and institutions of power. This chapter illustrates the diversity of contexts that underlie the performance of the press in the 22 countries. It reflects on the role of economy, carbon emissions, media freedom, climate vulnerability, and public perception of climate change. We examine these national contexts comparatively, elaborating on similarities and differences to gain a better understanding of the dynamics of journalism as a potentially transnational institutional force. We also use measures of media attention and the volume of domestic voices to demonstrate that tension between the local and the global is a constitutive factor of journalism; that local, national fields of power are crucial for particular kinds of domestication. The analysis ends with a discussion about four ideal types of domestication logics, or types of mediated civic epistemologies, in climate politics. 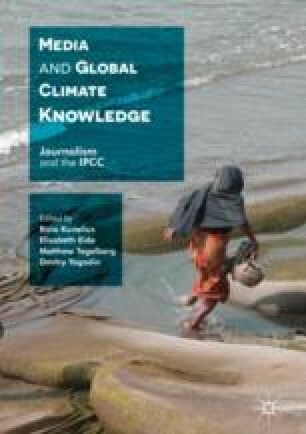 The chapter shows how such ideal types emerge from the actually existing local conditions of globalizing climate journalism. Statistics Norway. (2013). Statistisk sentralbyrå. Retrieved from http://www.ssb.no/en/Thompson, J.B. (1995). The Media and Modernity. Cambridge: Polity Press.